Springfield — A recent study conducted by the University of Chicago Crime Lab revealed that summer youth employment initiatives supported by members of the Illinois Legislative Black Caucus resulted in decreased levels of violent crime during summer months. Violence prevention programs provided jobs for thousands of at-risk youth during the summer months. Participants held a variety of jobs, ranging from camp counselors to administrative aides. A majority of the participants were from neighborhoods where unemployment rates exceed 19 percent. 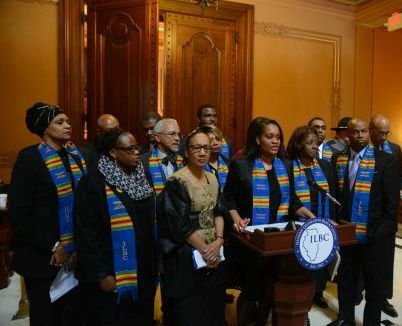 "Providing our youth with alternatives to being in the streets is necessary to ensure the next generation has the chance to thrive," said Senator Emil Jones III, Chairman of the Senate Black Caucus. "I hope Governor Rauner will take note and make funding for summer youth employment programs a priority." Representative LaShawn Ford, Chairman of the House Restorative Justice Committee believes summer jobs programs keep at-risk youth from entering the correctional system by having alternative activity that helps them develop life and career skills. "Housing an inmate in Cook County jail costs around $45,000 per year as opposed to the summer Youth Employment Program that costs around $3,000 per year per participant," Ford said. "Summer employment saves taxpayers money in the long run." Last year, the program provided employment and job skills training for more than 4,000 youth who worked part-time at partnering local businesses, government offices and non-profit organizations." "The summer months are primarily when we see a spike in crime across the city. If we want to see continued reductions in crime and create a stronger workforce, summer youth programs are where we can get our highest return on investing in our youth," said Black Caucus Chairman Senator Kimberly A. Lightford. A study by the University of Chicago Crime Lab found that violent crime arrests decreased by 43 percent for teens who were employed and received support from mentors. "Violent crime is incredibly regressive in its impact—it takes the greatest toll on society's most vulnerable," said Roseanna Ander, Executive Director of the Crime Lab. "There is far too little policy and research attention, as well as precious few resources focused on adolescents, especially those from disadvantaged neighborhoods who are really struggling." SPRINGFIELD – Students with developmental disabilities may soon find it easier to get the help they and their families need. Sponsored by Assistant Majority Leader Kimberly A. Lightford (D – Maywood), the prospective law would require the Dept. of Human Services (DHS) and the Illinois State Board of Education (ISBE) to train public school case workers to register students with the PUNS (Prioritization or Urgency of Need for Services) database. It is widely argued that due to a lack of awareness, PUNS is under-utilized, and therefore, in some cases, people with developmental disabilities across the state are not getting the services they need. The legislation is an attempt to ensure students in Illinois public schools and parents have the information they need to register with PUNS if they so choose. 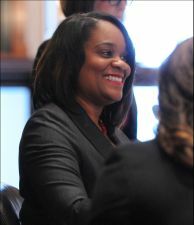 "The PUNS database was instituted to ensure that people with developmental disabilities were never overlooked and always given help," said Sen. Lightford. "Through this legislation, we can ensure that the database reaches its fullest potential so that these young people in the greatest of need can achieve their fullest potential too." DHS and ISBE would also have to develop a new program to provide resources and training for case workers so they are as prepared as possible to provide these students and their families with the information and advice they need. The measure also requires ISBE to inform parents and guardians through school districts on the PUNS waiting list. Senate Bill 226 now goes to the House of Representatives for further discussion. 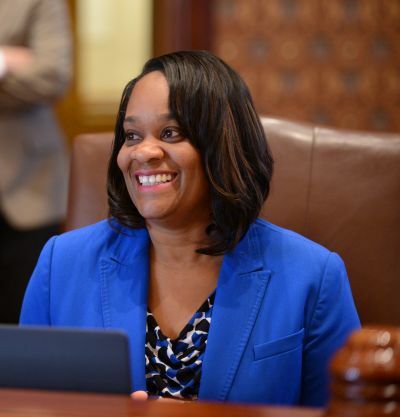 SPRINGFIELD – Students in districts with limited course options may soon be able to access a wider variety of courses thanks to legislation pushed through the Senate by Assistant Majority Leader Kimberly A. Lightford (D – Maywood). The option of taking classes from an outside authorized provider would be available to students who can demonstrate an impediment to being able to take another course at school or participate in another academic activity. "A student's potential should not be limited by his or her ZIP code," said Sen. Lightford. "The courses available to students in one area of the state should be available to students everywhere to ensure that we are giving all our young people the most comprehensive education possible. Equality of opportunity at the high school level now will lead to more equitable opportunity as the next generation applies for college and enters the workforce tomorrow." Starting with the 2016-17 school year, qualifying juniors and seniors would be allowed to take up to two of these special courses a semester. By the 2018-19 school year, all qualifying high school students would be able to enroll. Under this prospective law, the State Board would authorize course providers who meet a specific set of criteria for a period of three years, and the Board would also maintain a public catalog of courses available for students. The cost of each course would be negotiated between the provider and the State Board, which would transfer course payments to the provider on behalf of the responsible school district. The legislation, Senate Bill 1679, now goes to the House for consideration. 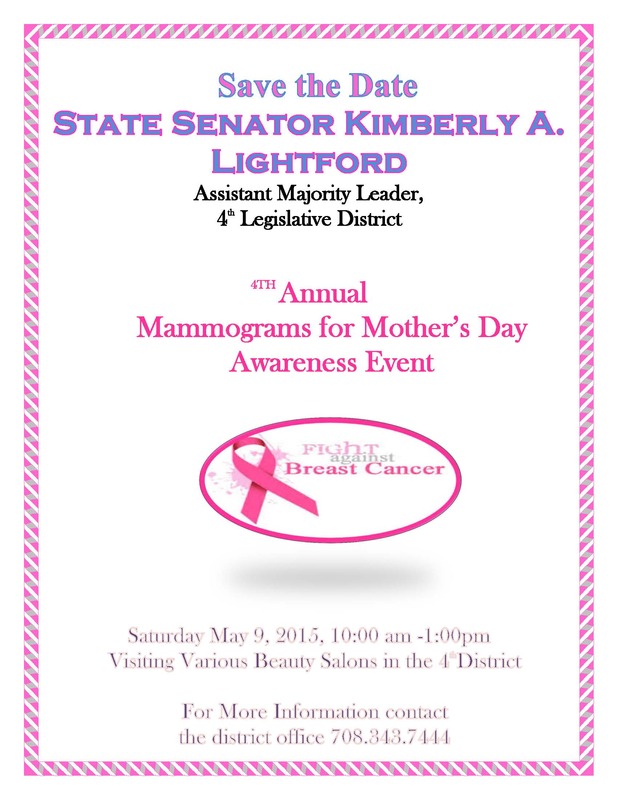 This Mother's Day weekend, on Saturday, May 9th, Senator Lightford will be holding her 4th Annual Mammograms for Mother's Day Awareness Event. The senator will be visiting several beauty salons throughout her district to discuss the importance of mammograms and other health practices in the fight against breast cancer. It is estimated that there were nearly 67 thousand new breast cancer cases in Illinois in 2014.